BANDI (The Color From Nature) is a brand that originated from Seoul, Korea. It is Korea's number one professional nail care brand that finally arrived here in the Philippines last 2014 thanks to Top That Corporation, a professional beauty supplier. BANDI actually comes from words Beauty Trend, Actually technique, Natural Nail, Dramatic Art and International Wannabe. There are a lot of known Korean celebrities that uses BANDI Nail Polish. With a strong hold of 60% of the professional nail market in their home country, BANDI is at the center of the fashion forward Korean nail market. Launched 2008, the brand is now committed to the environment by creating a safe eco-friendly formula and vivid color offering as inspired from nature. The BANDI nail color line is high gloss, long lasting, and quick dry. The formula is toluene/DBP free which is really great and more importantly it is not tested on animals. The patented HD wide brush is ergonomically for minimal brush strokes. Over 300 shades in various finishes ranging from glitter, frosted, sheer, shimmer, metal, pearl and neon are available. BANDI's popular gel color system, Gelique offers a unique experience for the nails. With virtually no drying time (30 seconds to 1 minute), color lasts up to 3 weeks. A 3-step easy to use system seals in the shade. With over 200 shades, Gelique offers one of the most comprehensive gel polish selection. There are a lot of shades that you can choose from that can be both used at home and professionally like in salons. Famous salons are in partnership with Top That Corp and they use BANDI nail polish like Get Polished Nails and Waxing, Nails Glow, Posh Nails, Nail Tropics, I Do Nails, House of Laurel Makeup Studio, Rejuva Spa, Nail Cocktales, Extraordinails, Dollhouse Salon and Spa and Mi N Me Nail Art. BANDI regular nail polish is also available in Zalora and Beauty Manila. When I arrived there, the nail art necessities are already set and they are ready for the guests. I am so excited to attend because it will be my very first nail art workshop! Not only that it will be my first workshop, it will also be conducted by BANDI's Philippines Creative Ambassador, Ms. Mimi Qiu. Isn't it great?! Ms. Mimi Qiu arranging her stash of nail polish for the workshop. 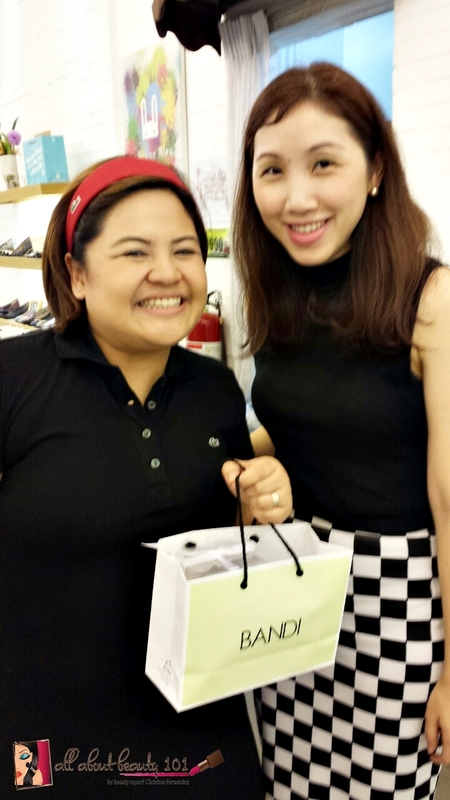 Ms. Mimi Qiu is a graduate of SLIMS Fashion and Art School and has 7 years of professional experience in nail art. I can tell that she is really good at what she does just by looking at her nails. I was so shy to ask a picture of her nails but its really awesome. It has a full nail art and with some 3D designs too! She is known to be an expert in acrylic, 3D and advanced nail art with certification from multiple trainings and seminars in Hong Kong. Last September 2014, Ms. Mimi attended and graduated from the BANDI Product Master Course and Gelique Advanced Course in Korea. Mimi enjoys using BANDI because of the color selection that is suited for Asians. 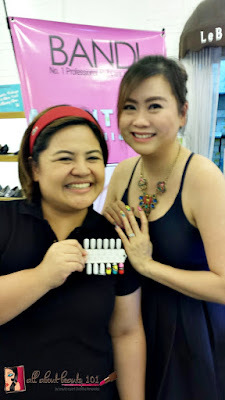 She quoted that, "The brand is trendy and can be used for endless possibilities of nail art." I agree to that, by attending the event, I was able to see their color selections by going around LeBunny Bleu store. The event started as Ms. Zerline introduced us to the world of BANDI and its latest trend of Avant Pop. It is the Summer Trend in Korea right now. I am sure you are wondering on how come it is a summer edition when it is already on the last quarter of the year. It is because it is considered summer time in Korea right now and they wanted to promote color blocking. What is really the Avant Pop Collection? According to BANDI, it is a splashes of vibrant colors mixed with abstract shapes are the inspiration for the collection. The Avant Pop Style is all about blending vivid color combinations, abstract shapes and textures. Everything from mirrored patterns to geometric stripes and spots to pop-inspired graphics and bold florals fall into the Avant Pop category - and they're often mixed and matched for an even more artistic look. Color blocks and comic-book speech bubbles give fun and funky vibe to the range. Daring in-your-face colors characterize the polishes of the collection. Frosted, neon and shimmer shadows complete the 8 color Gel Polish range like Hawaiian Pink, Avant Pop Pink, Petit Orange, Mango Mango, Soy Green, Tiffany Blue, Santorine Blue and Neon Red. Avant Pop combines animated hues with abstract art and bold prints. Reminiscent of street art, this expressive themes fuses eye-popping visuals with surrealist imagery. 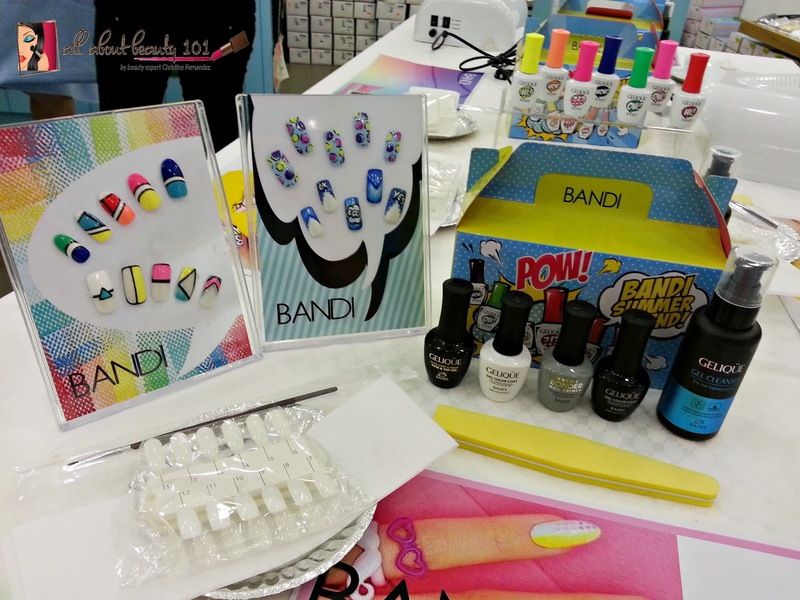 Outlandish motifs, pop-art inspired effects and bold patterns are the main focus of BANDI's nail art for the collection. It is like Summer Coming Up To You. With the tools they provided and prepared for us, I am now ready to learn all that Ms. Mimi will share to us about application of Gel Nail Polish. First, Ms. Mimi introduced us to the basic materials for Gel Polish like the wax papers, nail buffer, paint brush and of course the coats and cleanser. 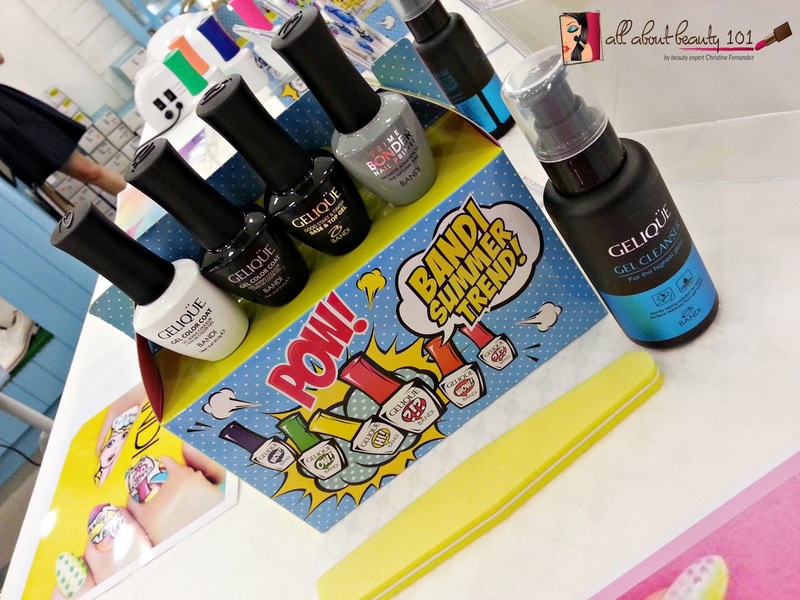 The basic Gelique items needed are the cleanser, nail primer, base and top coat, black and white gel nail polish. I will share with you my experience on the workshop step by step. We are doing the nail art on acrylic nails so that we can control the application better than when we apply it directly to our real nails. Second, buff the bails to make it smoother and even. If you look closely, the acrylic nails has white dust particles after buffering, it will also happen in real nails. Third step is to apply the nail primer. The primer is clear liquid and a little creamy in texture. Fourth step is to apply the base coat. The base and top coat is the same for BANDI Gelique. The base and top coat is thicker than the primer but still quite easy to apply. Fifth step, you have to place your nails under the UV light. The lamp is already timed for at least 30 seconds, you just have to wait when the light turns off that your nails are done. Sixth step, you have to clean your nails with the cleanser again because it got sticky after it was placed under the UV light. It is because we are going to use the Avant Pop Collection and we are going to copy the design on the photo below. We have to use the White gel polish for base. So, for the seventh step, use the White Gel Polish to fully coat your nails. Your first layer should be evenly applied and the layer should be thin because you still need to apply for the second layer. After each layer, you have to put it under the light. Afterwards, I tried to copy the style of the first design that we are supposed to do. It is so hard to do the strokes correctly doing nail art is such a tedious task that I find people doing it creatively and perfectly really talented. Look how ugly mine turned out. It looks so effortless when Ms. Mimi does it. Do not forget to put your nails under the UV light after each layer, okay? The next step is applying the black lines to create enhance the color blocking. We placed a black gel polish on a disposable plate because we are not going to use the brush. The black lines should be thin but I cannot do it. LOL. The last step is to apply the top coat then place it under the UV light. After that, you can clean the nails with the cleanser to remove the stickiness. For the other designs that I tried to imitate, well I can say that it is not my talent but I want to learn it. Now, I am tempted to buy my own UV light and gel polish just to practice at home. Thank you so much BANDI and Top That Corp. specially Ms. Zerline for inviting me to this wonderful workshop. Thank you Ms. Mimi for sharing your skills with us. Also, thank you so much for the gifts from the event! The pink nail polish is in partner with my uniform at work!